Reinstalling the application may fix this problem . So.. does it work? Suggestions? Complains? About Mission editor I recommend and note the following items ( I know that you are alone and working so hard on this and many of my offers and notes are cruel so please don’t get mad at me , but I wanted to share them with you and other guys , because you said yourself “So.. does it work? Suggestions? Complains?” ) . 0000000 – Please release a “7th demo – gameplay” for mission editor and then read these notes and do these if you like !!! My body aches for seeing the next demo ! :)) 🙂 😉 OK OK OK ? 1 – As you mentioned before copy-paste & undo-redo features . 3 – I cannot specify path to certain objects . There are just point to point pathes for now in straight lines , circle and curve pathes would be good ! 4 – I know that you want to add Weather in next releases , but in mission editor the Weather , fog , smoke Radars ( like in ms10 : launch ) and etc. would be great ! 5 – Joined and sticking objects will be fun like su33s that are parked on the Russian aircraft carrier in ms09 hotile fleet ! 7 – Selecting objects from objects panel in the left section of editor is good , but if you can put some MOVE option ( like photoshop : when click on a layer and can work on it instead selecting its layer from LAYERS panel ) in it so we can just mouseover on the desired object and click on it and the move it or turn it ! 8 – Can you specify and add MOUSE MIDDLE BUTTON feature for turning objects ? it is better that using alt key ! 9 – Please add aircarft other colors in the editor ! 10 – When we specify objects as enemy or ally , will they shoot or help us ? Is there any AI in them ? If yes that would be a great FUN ! 11 – You have plans for adding other missions like ms02 ms03 ms04 later ? right ? 12 – You have put player spawn points , the enemy and other spawn points will be the same objects creating points ? right ? 13 – The objects name that will be shown on the game will be “setup_radio(id, name, align)” ? 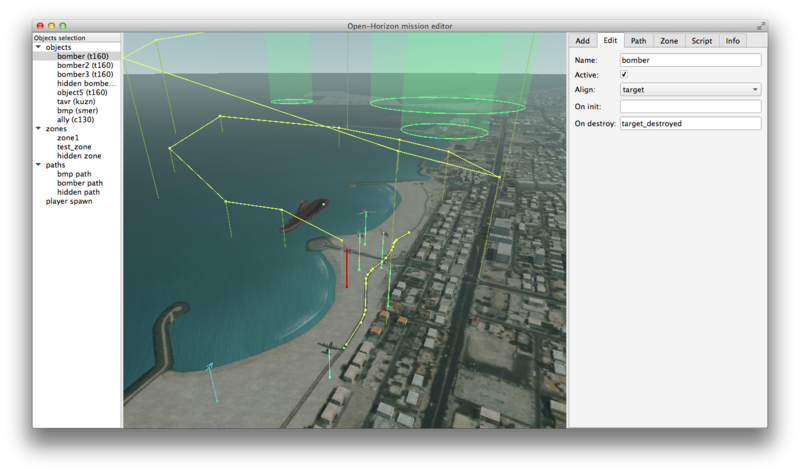 14 – Can you show objects heights and positions on the map in numerals ( and a menu that we can type numbers in them so objects will be align in those posisions ) so we can use these numbers to put objects in order ( like some aircrafts with equal distances in the same hieght like a squadron ) more easily ! That is hard to do that just with eye help ! 15 – I think for RE-creating missions and maps of AC4-5-6-0 we have to do it from scrath and zero , and that is so hard creating buildings , mountains , rivers , textures & etc. O MY GOD that is so hard ! but I hope you find a way to convert them from PS2 & XBOX360 sources as you mentioned in “Convertor for AC4-6 locations” ! 16 – How we can specify the time or events or conditions for appearing objects ? Thank you for the feedback. It’s up to me to prioritize tasks, but the more feedback I have, the more chances that I will implement useful features sooner. 2 – you can add script functions that will be executed on enter/leave. You can press Enter while editing function name to add callback to the script. Instead of shrinking you can create multiple zones and activate them from the script, that’s the point of creating zones visually. That’s a bug, will fix. 3 – I’ve added that option, will also add looping option. object will follow them smoothly anyway. 6 – You’ll get used to it, example missions would help to understand the basics. Few lines of code have less limits and is easier than tones of menus. 9 – Those planes doesn’t have custom skins. I will add skins for aces (using same models as players), but not sure when. 11 – It’s not a priority. I have more interest in AC4-6 locations, actually, but I will fix them sooner or later. 12 – I don’t understand the question. 15 – I hope so. I can load AC4-5-Zero’s textures already.